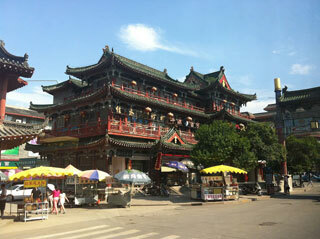 Kaifeng was once the capital of the Song dynasty, and is one of the Eight Ancient Capitals of China. The name "Kaifeng" first appeared as the area's name after the Qin's conquest of China in the second century BC and literally means "expand the borders". Its name was originally Qifeng, but the syllable qi was changed to the essentially synonymous kai to avoid the naming taboo of Liu Qim. This article uses material from the Wikipedia article "Kaifeng", which is released under the Creative Commons Attribution-Share-Alike 3.0 License.